Follow this article to dig out every mystery of VP10, Google next generation video codec! In August 2015, Google announced that they are working on VP10, a more compressed video codec aiming to deliver high-efficient video streaming, especially on 4K video. The popularity of 4K is predicated. Comparing to exist for TVs and cameras at the beginning, this UHD resolution has applied to expanded fields in webs (YouTube, Vimeo, Netflix etc. ), smartphones (iPhone 6s 4K video recording) and more. Meanwhile, the high bandwidth consumption issue during 4K video playback should be handled, which urges Google to roll out VP10. Yes, you may be not familiar with this new video codec, but this article will lead you to know everything about VP10. Nobody is sure for whether our devices or media players can support VP10 right now. 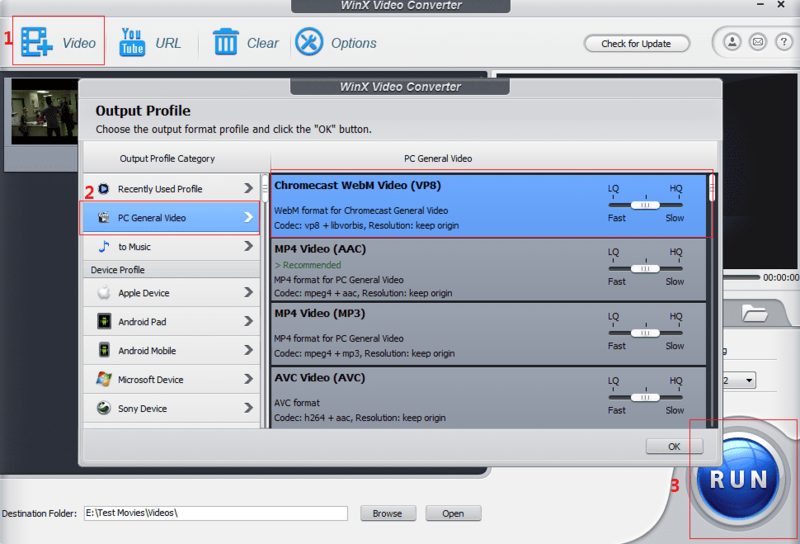 So, if you want to play VP10 videos on PC/Mac or iPhone, iPad, Android, Windows Phone etc, you'd better convert VP10 4K videos to MP4, AVI, WMV, MOV or other formats compatible with computers and devices with the best VP10 video converter/decoder - WinX HD Video Converter Deluxe. Inheriting features of Google's VP line of video compression technology, VP10 is an open and free video codec contained by WebM and Motroska. In order to obtain better support for 4K video on the webs, VP10 requires very low bandwidth and enhances the visual effect due to sharp images, rich colors, faster framerates and better dynamic range between lights and darks. Currently, Google has utilized VP10 for YouTube 4K video and Chrome, but release date of VP10 is supposed to be the end of 2016 according to James Bankoski, Google engineering's product manager. Google has launched VP9 for 4K video previously but achieves limited success on YouTube, Chrome, Firefox and Opera browsers. On the other hand, H.265/HEVC becomes the most famous 4K video codec with board support of Blu-ray, cameras, portable devices, operation systems (Windows 10, Android 6.0) and online video streaming services. And now, VP10 joins in the 4K video codec battle. Well, what're differences between VP10 and VP9 & HEVC? VP10 has cut half bandwidth of VP9 to achieve smoother 4K video playback online, which means that VP10 has a 50% higher compressed ratio than its previous generation. Comparable to VP9, VP10 also optimizes image quality showing a wider range of colors, more realistic scenery with the hope of transferring the best visual effect. To sum up, VP10 is superior to VP9. Google announced that VP10 achieves better image quality than HEVC and dominates on web video support thanks to highly reduced bit rate and less required bandwidth. On the other hand, Google's VP line improves slowly on hardware support. When HEVC boasts its efficient 4K video decoding abilities on hardware, VP10 is only applies to YouTube 4K video right now. The other difference between VP10 and HEVC is royalty. VP10 is free and open-sourced that everybody can use it for free while the patented HEVC asks for revenue charges. WinX HD Video Converter Deluxe is an all-rounded video converter available to to convert SD/HD/4K/8K videos encoded with VP10/VP9/HEVC etc, to general video formats like MP4, AVI, WMV, MOV, MPEG, FLV, 3GP as well as fashionable devices, iPhone, iPad, Android, Windows Phone, Kindle Fire, PS3/4, Xbox and more retaining high video/audio quality. It is also able to extract audios, MP3, WMA, AAC, AC3, FLAC, iPhone Ringtone (M4V) from VP10 videos. Thanks to multi-core CPU support, the improved configuring for i5 i7 CPU, the optimized AMD 3DNow! and Intel SSE3 SSE2 MMX Instructions, it can deliver 83x faster real time converting speed. ▪ Download VP10 4K video and other SD/HD/4K/8K/3D videos from YouTube and alike sites (300+ in total) with original quality at a very sharp speed. ▪ Create photo slideshow video in WebM, MP4, AVI, WMV, MOV, FLV etc, with background music from album. ▪ Crop/trim/merge videos and add external subtitles. Customize video/audio parameters, bit rate, resolution, aspect ratio, frame rate and others to grab better output effect.